Frustrated when your catnapping baby takes ridiculously short naps? Take a look at these 5 ideas that can make a huge difference with your baby’s naps. Is this normal? I thought. Is this just his temperament? Do babies even grow out of this?! My baby hardly slept during the day—maybe 30 to 45 minutes at a stretch. He was tired and cranky when he wasn’t asleep, which only meant he’d take an even longer time to fall asleep at night. One thing was certain: we were both exhausted from these catnaps. Nothing that seemed to work for every other baby was working for mine. He didn’t take to the pacifier, finding it more frustrating than soothing. I knew he couldn’t be hungry since I had just fed him minutes ago (and he’d fall asleep during nursing, anyway). Even strollers and car drives didn’t work—he’d wail the entire time instead of feeling soothed by the motion. As if being a newborn mom wasn’t hard enough, dealing with a catnapping baby just adds to the challenge. You can’t exactly “nap when the baby naps” when you can barely fall asleep during those short stretches. Putting the baby to sleep (sometimes up to an hour!) takes longer than the actual time he falls asleep. It’s enough to make any new mom feel alone, angry, even resentful. As frustrating as it is, not giving up is key. In fact, by trying a ton of things, I was able to find a few strategies that helped my catnapping baby to sleep in longer stretches. These hacks were so simple, but made a huge difference almost immediately. None of us go straight to a deep sleep, only to wake just as abruptly on our own. Instead we—including babies—enter and exit sleep cycles, whether during naps or at night. When one sleep cycle ends, you and I can choose to welcome another one if we want to keep sleeping. But newborns don’t always know how to fall back asleep after these cycles, even if they want or need more rest. That’s why many parents find predictable patterns to their babies’ sleep. Whether 15, 30, or 45 minutes at a time, we can almost pinpoint to the minute when they’ll likely wake up. The trick then is to comfort your baby just as that first sleep cycle is about to end, so that he can start a new one. Catch him as he’s starting to stir but before he has completely woken up. That way, instead of one 30-minute nap, you can now hope for a 60-minute (or longer) nap. You can also experiment with different nap times. If this trick doesn’t work for the morning nap, you might have better luck for the afternoon one. 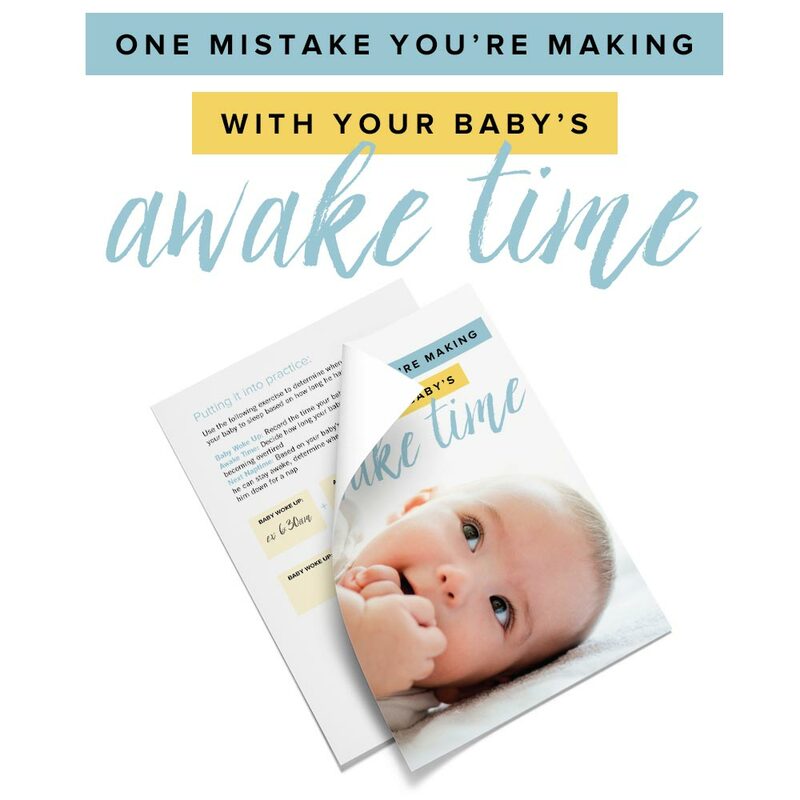 You might already think that your baby is hardly awake, especially when you barely pass an hour and a half and it’s already time to sleep. But I’m willing to bet that if you experiment with shortening his awake time even more, that you just might have some luck with his catnaps. If he’s normally awake an hour and a half between naps, try shortening that to an hour and 15 minutes, or even one hour. Adjust his awake times by 15-30 minutes and see if that can prevent him from taking a catnap when it’s finally time to put him down. Relying on sleep cues may not always be reliable, and waiting until he’s fussy means he’s already overtired. 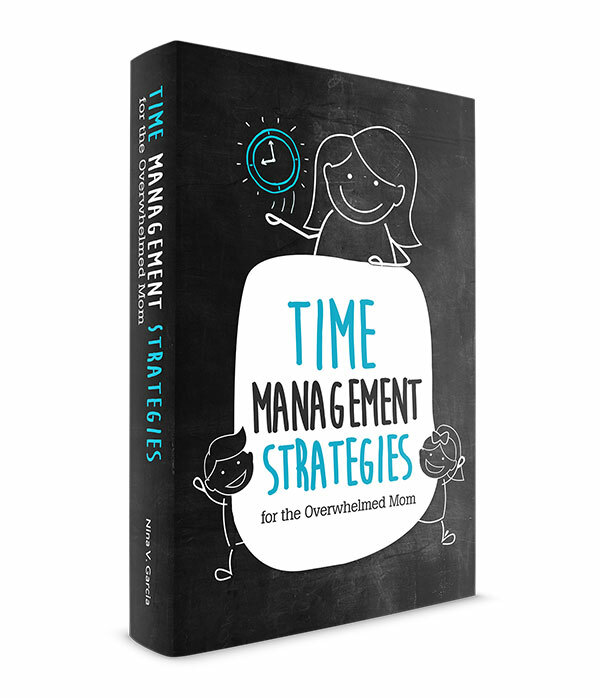 Try a little earlier than usual before he’s overtired and see if that can stretch his nap. Does your baby go to sleep after 8:30pm? That might be too late of a bedtime, leading to poor night sleep and therefore erratic and short naps the following day. Just as you did with your baby’s awake time, experiment with moving bedtime earlier to catch him when he’s ready for sleep, not overtired. If he’s already sleeping earlier than 8:30, try putting him down 15-30 minutes even earlier. Sleep begets sleep, so the better sleep he has—especially at night—the better quality sleep he’ll have for future naps. Get more tips on creating a nighttime routine for your baby. Many parents like me have a love-hate relationship with sleep aids. We love how effective they are, but hate how reliant we become on them. Yes, you should encourage your baby to sleep on his own and give him as many opportunities to do so. But at the end of the day, you’re also in survival mode during the newborn stage, and sometimes that means reaching for whatever sleep aid works. Baby wrap. I used the Moby Wrap, which kept my babies close to me while leaving my hands and arms free. Being in this snug position and close to you will help your baby sleep longer. Swaddle. A ready-made swaddle like this one is perfect for quickly putting the baby in a snug swaddle. Plus, they’re less likely to come apart than regular blankets. 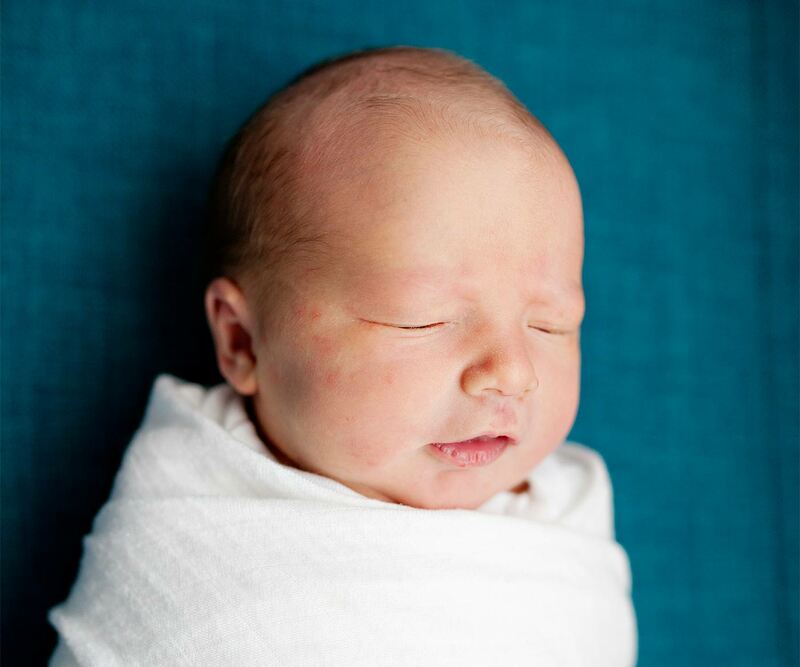 Like the baby wrap, swaddles keep your baby tight and cozy, lending itself to longer sleep. Sleep suit. If your baby fights wearing a swaddle, a sleep suit like the Magic Sleepsuit is a fantastic option. His arms are free but still somewhat contained, preventing him from flailing his arms and waking up. Swing. If your baby likes sleeping with motion, putting him in the swing like this one can help lull him to take longer naps. White noise. Prevent loud or sudden sounds from startling your baby awake by using white noise. Use a white noise machine like this favorite among parents, or even simply a fan, heater, or an audio app. Does your baby wake up crying because he’d rather be with you? One trick that has worked for me and several other parents is to wrap him in one of your old shirts. Pick a shirt you’ve worn a few days and has your unique scent. Then, keep it near your baby (make sure to monitor him while he sleeps!) so he can feel comforted by a familiar item that feels and smells like you. Caring for a catnapping baby is no easy feat, especially for the exhausted new mom, but you’re not without options! Start by experimenting with your baby’s schedule, from keeping his awake time shorter than usual or putting him to bed earlier than you normally do. Once he does nap, comfort him after the first cycle to prevent him from fully waking up. When all else fails, use the right sleep aids to help him stay asleep longer, from swings to swaddles to suits. And finally, try offering him one of your old shirts so he has a familiar item to comfort him as he sleeps. In hindsight, I can see now that my baby’s sleep patterns were normal, however frustrating they were. And thankfully, I found simple hacks to help my catnapping baby take longer naps—even when strollers and car rides didn’t do the trick. 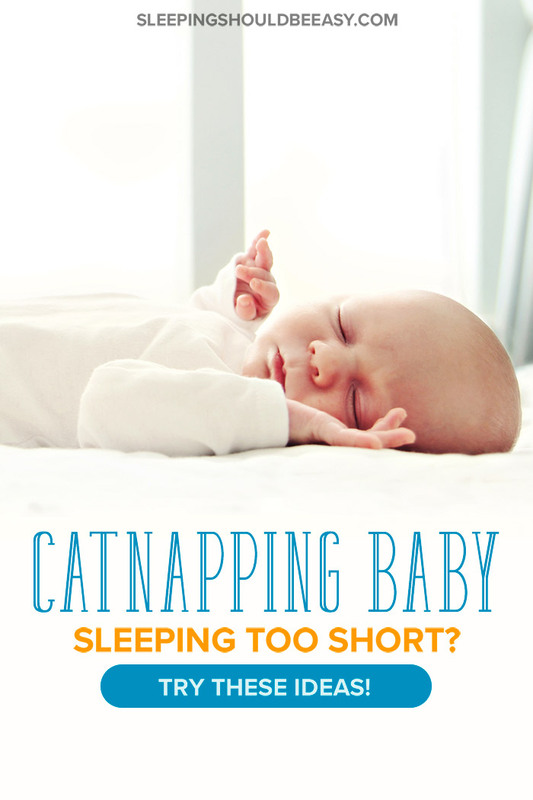 Tell me in the comments: What is your biggest struggle with your catnapping baby?